Lydia Bakes: Cake Fails and my First Giveaway! Cake Fails and my First Giveaway! Well, that was one heck of a week! This was my first week at university studying Early Childhood Education. Although it won't be like this every week (usually we just do one day and one night a week) I cannot believe how absolutely physically and mentally exhausted I am! I feel like I haven't used my brain since I was 18 so that might have been the reason why! I did have a great week though, I made lots of new friends and I'm really looking forward to starting the proper study and working in an Early Childhood centre. I can't wait to sleep in tomorrow and have a tiny bit of relax time before starting again on Monday! So, now about my failed cakes which I'm sure you're all very excited to see. Well, I’m a perfectionist (in case you didn’t know) which actually comes in handy when decorating cakes and baking as it’s all in the details. It does, however, mean that I don’t always show you when I make mistakes, which by the way, happens ALL the time! Like last week, I made some lemon cupcakes for no reason in particular and they turned out SO dry and yucky, luckily I filled them with lemon curd. Thank goodness for lemon curd, it makes everything better! So here goes *takes deep breath* some of my cake fails over the past three years that I haven’t shared with you because, let’s face it, I want you to think I’m perfect! I cried, I had a tantrum, I cried some more then eventually (and I mean this took a long time to get to this point) I laughed. I had to. I mean, LOOK at it! Barf! My second fail I actually DID post on my blog, it was so much hard work but still ended up a wobbly mess. I think I almost had a heart attack delivering this shaky cake to its recipient. All sorts of things went wrong with this cake but I think it all started off with its massive size. I think if I were to do this again I would have at least halved the size of the cake. If there were more people to feed I could have just added cupcakes… *sigh* ah well! You live and you learn! At some point along the way I learned that it would be a good idea to practice before trying a technique for the first time so now we come to all the “firsts”. 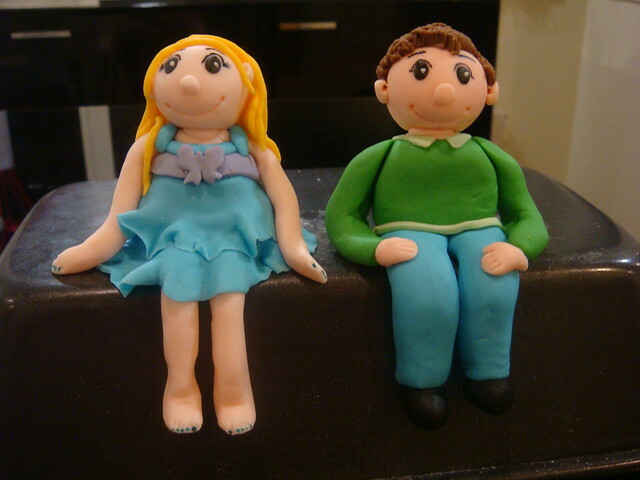 First time painting fondant, first time making fondant people, first time using a stencil on a cake. All I can say is I’m SO glad they were all practises! 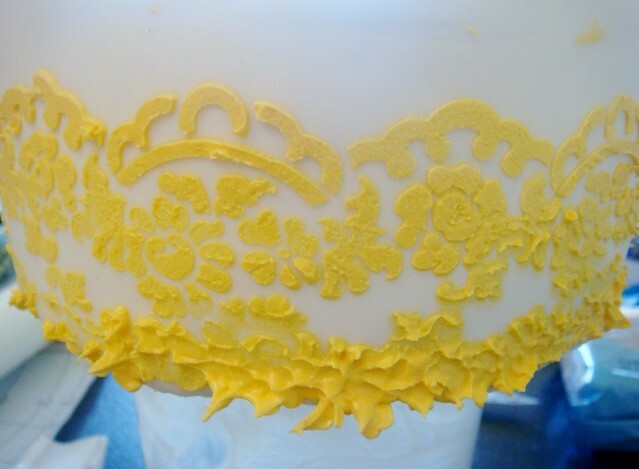 Practising stencilling onto a cake...good thing I didn't do this for the wedding cake! 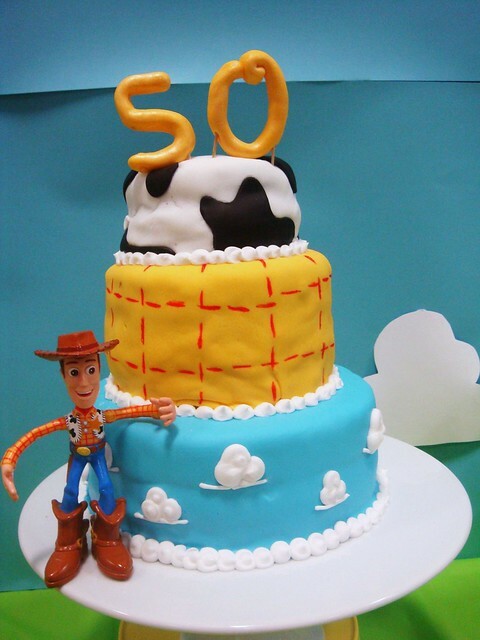 Lastly, this cake I made for my mum’s 50th birthday which was a Toy Story themed party. You may have read the post on the amazing Toy Story dessert table that Danelle and I put together one painstakingly long weekend. Well, the cake was made from new recipes that were gluten free where I tried new things like sticking cherry jam in the centre of the top tier cake and drawing (freestyle WHY OH WHY did I go free style?!) lines on the fondant covered middle tier then there’s the giant 50 that just would not stay on top. At least if you squint your eyes the mistakes aren’t as obvious and I don’t think it took away too much from the rest of the amazing table. Whew! So now you know my cake mistakes, please don’t judge me or never ever come back to my blog again for fear of returning to another scary post like this one! I promise the next post will look much prettier than this! Now for the give away. I'm very VERY excited to announce this is my first giveaway and it's an awesome one! The amazing team at The Home Store Milford have provided me with a lovely Fondant Prize Pack from Little Venice Cake Company valued at $102 to give to one lucky reader. All you have to do is comment on this post to get in draw. To make me feel better, tell me about your baking or cooking fails and you'll go in the draw, easy as that! Please be sure to include your name and email address. 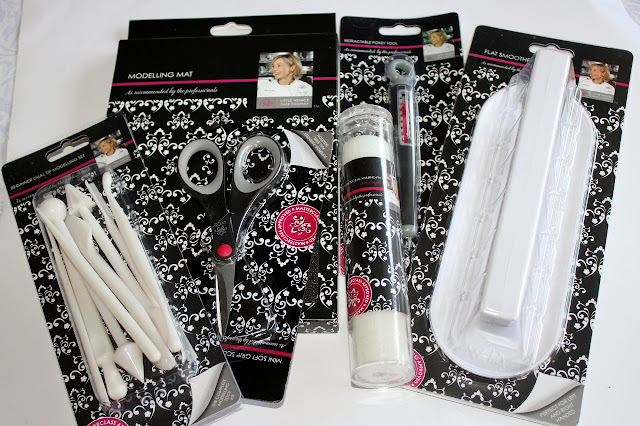 Congratulations to Di who won this amazing prize pack, I hope you enjoy decorating cakes with these handy tools! Be sure to check out the Little Venice Cake Company on Facebook to get decorating tips and check out their photos, with some of their clients being the likes of...THE QUEEN! Whaaaa?! They're pretty famous! Also, don't forget to head into The Home Store Milford for all your cake decorating supplies. They also have some awesome cake and cupcake decorating classes at really good prices! Sorry, competition is only open to New Zealand residents. Competition will be drawn on the 3rd of August 2012 at random using the randompicker.com generator. Good luck! I can safely say I've tried your risotto so I know how delicious it is, must not have been used with stock cubes haha! Thank you for sharing these photos - The first one really made me smile, that ship looks like it is leering at someone. But....I am sure the people you made them for with love, were really appreciative. I couldn't cook a thing when I married. but just gave everything a go - my first pavlova was whipped up with a handbeater - I got too tired so just piled the lot onto a tray and kept scooping it up when it tried to run off. Whacked it i to the oven thinking the heat would stop the spread...Ha! Drip Drip out of the door, can you imagine the mess! One time I made bread for a dinner party and forgot the yeast - little hard bricks that even the birds didn't want! We all have to start somewhere - keep going and keep smiling. Thanks for your entry, pavlova's do sound terribly tricky! It is great that we can learn from our mistakes! Good luck with the draw...not long to go now! Gosh Lydia, I'd hardly call those pictures "cake fails"! They're not quite like what you usually post, but you're still the absolute Queen of fondant in my mind! Amazing. The 'baking fail' that still haunts me is forgetting to grease the cake pan of a birthday cake I was making for a good friend. Perfectly risen cake emerged from the oven, only to stay firmly stuck to the pan and eventually come out in pieces. My heart broke! Cue a little quick thinking and icing, and we ended up with cake balls instead. Not quite the fabulous cake I'd promised! Love the giveaway by the way - such a fantastic prize, would love to win! If not, I think I might have to wrack your brains and help me work out what to pick up to give fondant a try! Oh what a great idea making cake pops! I bet your friend loved them just as much! Thanks for your help coming up with an idea for the giveaway! My most disastrous cooking failure was profiteroles. I had never made them before and the pastry was a complete disaster. Little tough balls of rubber and I have no idea what I did wrong. that was about 15 years ago and only last week was I brave enough to try them again. This time thankfully was a much better result! Oh wow profiteroles sound SO tricky to make, you are so brave! Well done for getting them right this time around, I've never tried making them they seem so daunting! Good luck for the draw! Awh thank you, you're too kind! Maybe these cakes looked worse in real life? Haha! Andrina says my biggest cooking fail is putting fruit in everything. I like to mix it up and put odd fruits in salads. Who knew over-ripe nectarines don't go with iceberg lettuce and mayo! Actually my biggest fail was when me and dad entered the father/son bake off for boy scouts. We didn’t know what we were doing, forgot to put in baking powder and the cake turned into a brick. Mum was laughing at us the whole time. Anyway we took this thing to the bake off and it looked like a tile (same height and stiffness), I don’t even think we put icing on it. Love this story! Poor Leigh, I don't think baking was required in Immigration work huh? Hahaha! 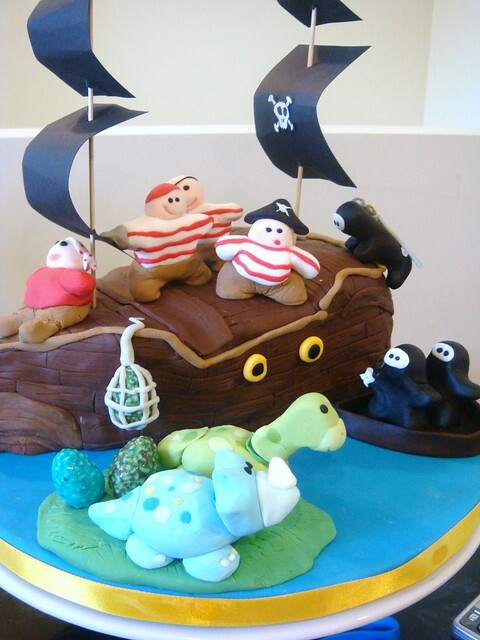 You'll have to pass on your great cake knowledge when you have kids one day haha! Like you I'm a perfectionist when it come to my cakes, But I have had a few dilemmas most of them involve fondant. Either I didn't roll out the fondant wide enough to cover the cake or it rips and has a big hole on the side, not pretty at all. I love reading your blog, so I have nominated you for the Versatile blogger Award. I love your cakes! It is kind of nice to know that others make mistakes though (not in a mean way haha) I do hate it when fondant rips or isn't big enough to cover a cake, especially once it's all covered in crumbs on one side already! Argh! Awh thank you so much, you're so sweet! Good luck with the draw, I will have to get your email address if you win. When the cupcake craze started, I thought I’d be adventurous by trying raspberry ripple cupcakes with cream cheese frosting. I glanced through the recipe and it looked easy enough. After I had put the cupcakes in the oven to cook I read through the recipe one more time to see that it listed baking powder in the ingredients list but not in the method. Needless to say the cupcakes were a disaster and did not rise to the occasion! I’ve since amended the recipe so I won’t forget such a key ingredient. Oh dear, cupcakes without baking powder! I hate it when recipes do that, it's not really your fault! Good on you for changing the recipe, I bet the cupcakes are delicious! Your cakes still look gorgeous :). My biggest fail was when i was making some last minute cupcakes and doubled the butter and completely forgot the sugar! Oh it is hard to remember all the ingredients when doubling sometimes, a little while ago I had a cake in the oven then realised I completely forgot oil! I didn't both waiting to see the outcome I just threw it out and started over again. Happy first givaway! Thank you for being honest & showingus your first cakes! 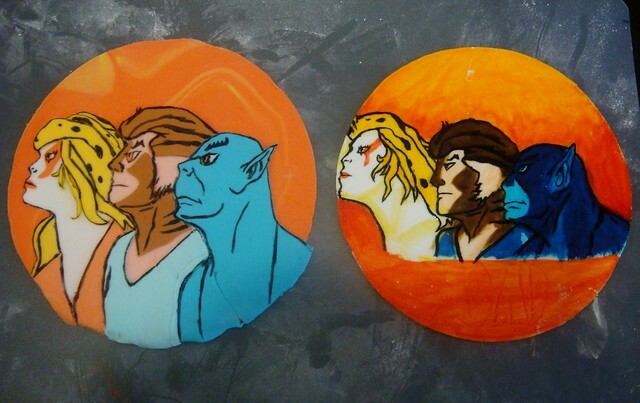 (Which by the way still look awesome!) You see quite a few "This is my first attempt" & the cakes are AMAZING!! Fondant & me quite often have battles! Lol! it tries to escape from my cakes by ripping away! Awh you are just too kind! Yes that is funny, lots of first timers get it right first time, I always get jealous when people who make macarons the first time get it right too haha! Fondant can be a real pain in the bum sometimes! A round cake with his face on the top with fondant. Well it came out looking like Dr Robotnik from Sonic the Hedgehog! I was so embarrassed but had no time or ingredients for that matter to try again. Oh the shame! I don't think I'll be getting another order from that family haha! Thanks so much for putting these photos up. It's nice to see that other people make mistakes too and people don't just create these perfect cakes first time round. I LOVE the before and after photos of your people too! I don't think your cakes were that disastrous, they still looked like great cakes! Thank you for your kind comments! Oh man Thomas is a pain isn't he? Mine also turned out pretty disastrous! 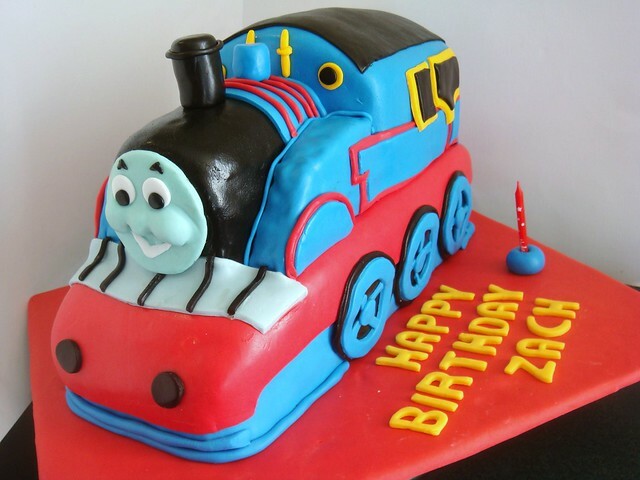 I think Thomas cupcakes might be easier? Haha! 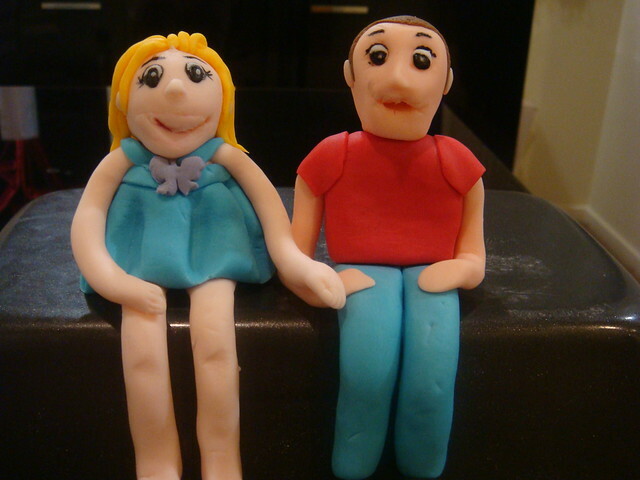 Glad you liked my retarded people, I actually tried to model them on me and my husband (don't worry, we don't look anything like them!) but the first ones are HILARIOUS! We look like old people who are sinking hahaha! 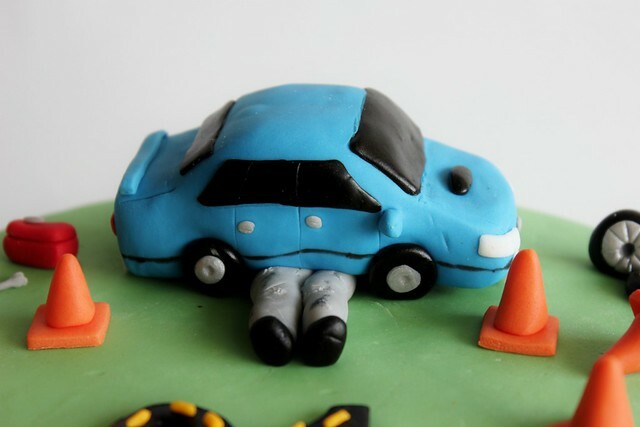 I would hardly call these cake fails - they are awesome! my biggest fail - was on delivery - made the big mistake of having the cake on the front seat rather than the floor - slamed on breaks - cake ended up on the floor upside down!!! Manged to patch it up - but the teddybear never recovered his lean!! Oh dear that sounds so sad, poor teddy! Glad you managed to patch him up okay. Oh you are too kind, they're certainly not like the normal cake photos I post on here! Haha! Oh thanks for sharing your stories, I know exactly how you feel! Me and my husband once used icing sugar (instead of flour) to coat fish once...that was interesting to say the least! Hahaha! Awh no your poor cake, at least your doggy got to try some! You are so right, we do learn from our mistakes! Awh no your poor fairy party! I hope you were able to eat other yummies like fairy bread (my favourite). Haha I'm sure burnt blue cupcakes don't look that appetising, but you never know, they might have tasted good! Thank you so much for sharing that story! I'm so glad you continued loving cakes after your mishap, I bet the cake still looked and tasted amazing! I had a similar upbringing, my mum always made us amazing birthday cakes which inspired me to start cake decorating too! Hi Lydia - your cake fails look pretty impressive actually! I'd be stoked to get one. My own cake fail was when a friend's daughter asked for a mermaid cake for her birthday. I attempted to make a mermaid out of fondant but it ended up looking like a merman who might be quite comfortable on dark street corners. Suffice to say I did not send it to the 5th birthday party (imagine the trauma I could have inflicted!) Instead I got a barbie, put a tail and shell bra on her and used that instead. One happy little girl - thank goodness. Oh thank you, most of my cakes are much better than this usually haha! Awh I loved how you saved the day with the barbie for the little girl, I'm sure she loved it in the end! Good luck for the competition, I'm just about to draw it! CONGRATULATIONS DI! You have been selected using radompicker.com and have won the Little Venice Cake Company fondant decorating pack courtesy of The Homestore Milford. Thank you for your entry Di, I will be in contact with you shortly to organise shipping. Hope you enjoy decorating some fun cakes with this awesome prize pack! Sooo many failures where do i start... i recall my very first fail in the kitchen! when i was 11 years old in home economics we were tasked to make something savoury and something sweet for our parents to have for lunch... each class member invited one of their parents to the class at lunch time and we slaved in the kitchen until they arrived... i had everything planned i was soo pleased with myself! my dad loves pies so i though i would make mince pies i even shopped for the ingredients myself... little did i know there were sweet pastries as well as savoury i assumed all pastry was for pies (yes i used ready made pastry) to cut it short my poor father lovingly enjoyed sweet pastry with savoury mince and vege pies for lunch. He was soo kind he didnt mention a thing that is until the teacher tried my cooking and spat it back out onto the plate... I've nver made a mince pie again since! Lydia i must say you are a very talented young lady and have given me inspiration and excitment in the kitchen and i have been priveledged enough to have had a cake made and decorated by you and i think to this day people still talk about our "amazing" engagement cake :). Hahahaha! Your Dad is so sweet for not telling you! Knowing him, he'd definitely tell you nowadays haha! I think you should try making pies again someday and then I'll try them, deal? That cupcake adventure didn't turn out to be a fail so that doesn't count haha! Awh you are so sweet! Any time you want a baking date you're always welcome here! Good luck for the comp, I'm just about to draw it -how exciting! I cannot believe you class those incredible cakes as fails! Good luck with the ECE training. I think ECE teachers are saints - and those cakes certainly show you have loads of patience, so you will be fab at it! Awh you are too sweet! I sort of can't wait to post some better cakes/baking though haha! Oh thank you so much, I've only just started and I'm liking it so far, it's pretty full on but it's exciting!